Parkour (sometimes abbreviated to PK) is a sport in which participants use a variety of gymnastics, tumbling and balance moves to run quickly through an urban environment. Participants negotiate obstacles by jumping, vaulting, swinging, climbing and scaling walls. While Parkour is not competitive, its close relative, “Freerunning,” is a competition sport. Freerunning is similar to parkour but includes acrobatic trick moves such as aerial rotations and spins that aren’t efficient in terms of speed of movement through a course, but add drama to the sport. Parkour and freerunning were developed in France, based on the originators’ experience with Vietnamese soldiers’ use of the techniques as a means of escaping pursuit. Parkour is now taught to the British and U.S. marines. Parkour has received publicity from its inclusion in video games and popular movies such as Casino Royale, where it was employed in a famous chase scene. Because of the obvious risks, you should discourage your students from practicing parkour in real-life, outdoor situations. However, you can use the sport’s growing media-generated “buzz” to make it a popular addition to your gymnastics unit. 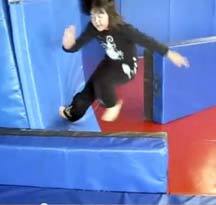 Here’s a video that is a compilation of a 3-week parkour unit for elementary school students. This entry was posted in Gymnastics, physical education by Richard Moss. Bookmark the permalink.